Salmon is that pink colored, distinctly flavored fish that, with some salmon fillet recipes, can add fun and sophistication to your dinner table. Salmon is one of the few fish in the world that is born in fresh water, swims out to the ocean to live in salt water, and then returns to the stream where it was born to spawn. Fish that live in this manner are called anadromous. For centuries, people and wildlife have relied on this cycle for sustenance. The world's salmon population has been depleted drastically due to over-fishing and the construction of dams that block the salmon's access to spawning areas. In order to keep up with consumer demands for salmon, commercial fisheries have been started where the salmon is raised. Although there is no noticeable taste difference between farm-raised and wild caught salmon, there is a difference in the color of the fish's flesh. Wild caught salmon has the distinctive pink color while farm-raised salmon has a white colored flesh. In order to produce the desired pink color, farm-raised salmon are fed a coloring agent, sometimes a dried red yeast, sometimes the fish are fed astaxanthin, which is an anti-oxidant. Most Atlantic Salmon that is on the market is farm- raised while most Pacific Salmon is wild caught. All Alaskan salmon is wild caught. In fact salmon farming is illegal in Alaska. 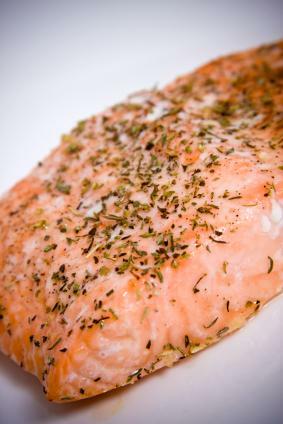 Because salmon is so flavorful, most salmon fillet recipes will be relatively simple. This gives the cook an opportunity to complement the flavor of the salmon rather than overpower it. These salmon fillet recipes let the salmon's taste shine through and are easy to do. This recipe serves 6. If you have a griddle, I suggest you use it for this recipe to give the salmon nice grill marks but any pan will work. I like to use Crème Fraiche to make my tartar sauce you can substitute mayonnaise if you do not have Crème Fraiche handy. It's best to make the tarter sauce first and let it chill as you cook the fish. Mix together the crème Fraiche, pickles, capers, chives, and parsley in a bowl and taste for salt and pepper. Place the tartar sauce in the refrigerator until needed. Mix together the flour and salt and pepper. Lightly coat the salmon fillets with the flour mixture. Place the oil in your pan and heat over a medium flame until hot. Place the salmon into the pan and fry for 5 minutes. Do not move the fish around in the pan. After five minutes, carefully turn the fish over. The sides of the fish will tell you how the cooking is going. You will see the flesh turn to a light pink as it cooks. Once the whole fish is cooked, serve the salmon with the sauce. Slice the salmon into ½ thick slices. Mix in a bowl the olive oil, basil, garlic, and add salt and pepper to taste. Add the salmon to the bowl and toss to coat well. Let the salmon rest, covered, in your refrigerator for at least one hour. When ready to cook, thread the salmon lengthwise onto the skewers. Grill over a medium hot grill about two minutes per side.